Summary: Fleetwith Pike stands sentinel at the eastern end of Buttermere with a distinctive almost triangular shape when seen from the other end of the lake. It is bounded to the north by the Gatesgarth valley which rises up to Honister Pass and to the south the fell drops down into Warnscale Bottom. Justifiably Wainwright had this fell listed from the inception of his guide book idea and it remains a favourite with many walkers. A realatively simple ascent to the summit can be made from the top of Honsiter pass where there is a car park. This route is about 1.5 miles in length and ascends 876′ to the summit. The alternative route of ascent is from Gatesgarth up the north-western ridge, a route of just 1 mile but approximately 1650′ of steep walking. The second option is my preferred way of ascent, the views back down into the valley are exceptional. 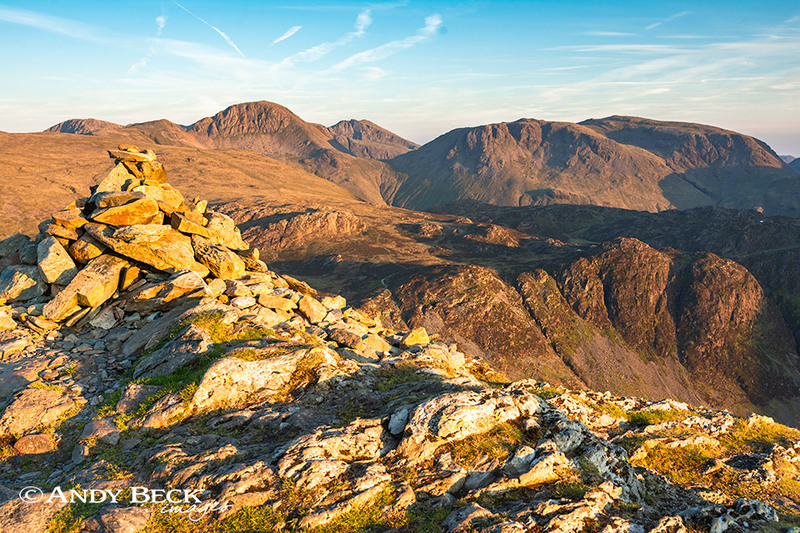 A fine half day circular route can be made over Fleetwith Pike and round to Haystacks, starting and finishing at Gatesgarth. Topographical details: The height given by Wainwright was 2126′ taken from his maps of the day. This has now been recalculated as 2129′ 649m and the highest point is at GR: NY20592 14166. A rough cairn marks the Wainwright summit but nearby to the west and slightly lower can be found a neat 5′ pillar of stones. Points of interest: At the top of Honister Pass is located the Honister Slate Mine, England’s last working slate mine. It has several attractions and is well worth a visit. 500m south-east of the summit can be found Dub’s Hut, a stone built quarry building maintained by the Mountain Bothies Association, ideal for an overnight stop. Please respect the facility and leave it as you would wish to find it. There are quarry workings in this area but exploration is not advised as these can still be in use. If ascending from Gatesgarth the white memorial cross on the lower slope of the fell can easily be seen, a memorial to Fanny Mercer who died while descending the fell in 1887. Excellent views from the summit not only of the Buttermere valley but also round to Great Gable and the Scafells. Tarns: There are several small unnamed tarns just to the east of the summit near Black Star. Waterfalls: At least two decent sized waterfalls can be found in Warnscale Beck, they can be accessed with care. Adjoining fells: Grey Knotts can be reached by a route via the disused drum house near Dub’s Quarry. Haystacks is gained by a path round the head of the Warnscale valley. Nearest facilities: Car parking at Gatesgarth Farm (£4? all day). There is limited parking further up the Gatesgarth valley but leave access free for other traffic. Car parks also at Honister Pass (pay and display). 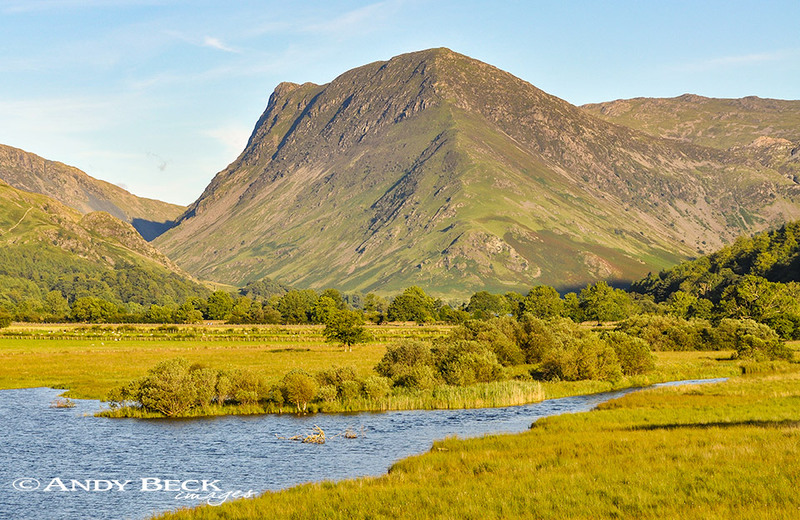 Star rating: (3.2 / 5) Fleetwith Pike’s two main routes of ascents means that it appeals to both the serious walker and the less agile. Good car parking and the attractions at Honister Mine as well as superb views along the Buttermere valley. The bothy adds to the rating. 11/11/07 Remembrance on Great Gable and Fleetwith Pike.